We are a family run business based in Edinburgh. 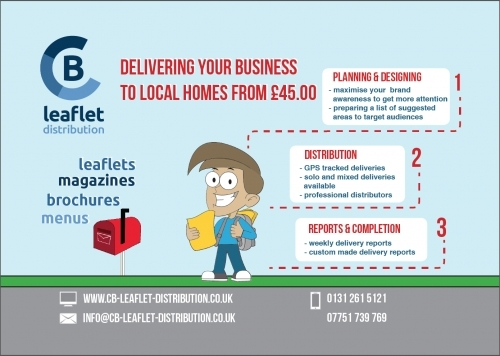 I started Central Belt Leaflet Distribution because as a self employed tradesman I struggled to find a reliable leafleting company that brought in a good response. When I set up our first distribution team my business nearly doubled. I originally started just to make my life easier but it has become a successful business all in its own right. Luckily I had the know how because I worked as a full time leaflet distributor myself in London from 1999 to 2004. We have been offering this service to other companies since 2011 and now cover the whole central belt of Scotland. We also operate street marketing campaigns, magazine distribution, printing and design. It's our purpose to make small companies thrive and we would love to help you get your business expanding. Professional and friendly service. Only company in Edinburgh using Live GPS tracking, where you can closely monitor your distribution real time. Over 15 years experience. Place your message straight into the hands of your target demographic via our friendly and informative teams. We offer solo and shared GPS tracked campaigns. Our Live GPS tracking system is a helpful tool that gives you assurance your leaflets are delivered. Delivery of magazines from £100 per 1,000 depending on size and weight. Don't have a design? No problem! We can assist our clients with professional design and artwork. So you need your materials printed? No problem! We can assist our clients with high quality, cost effective printing. "I am very satisfied with the results. Professional and good service!" 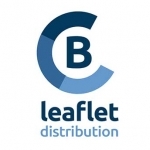 "I was impressed with the straightforward and efficient service from CB leaflet distribution at every stage of our project"
"They do what they say they will do, and they do it quickly and efficiently, exactly what I&rsquo;m looking for in a supplier."